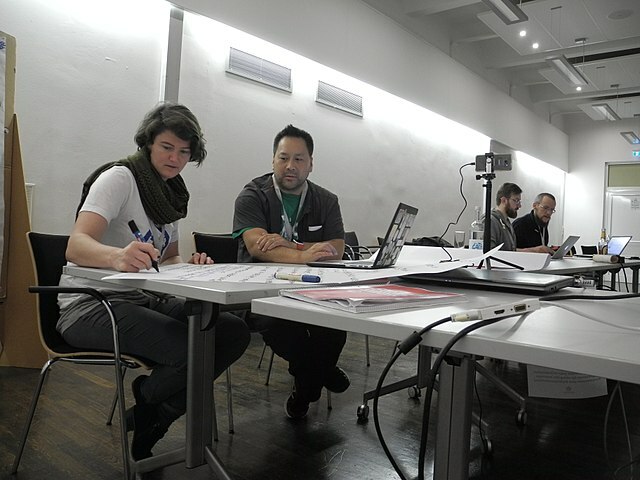 At the WikidataCon 2017 I organized a participatory design workshop on documenting and sharing Wikidata editing workflows. Here, I describe what we did. It should be sufficient information to organize such a workshop yourself. I used similar methods before, but this particular way is new, so if you try it, I am very interested in hearing about your experiences! I scheduled the workshop to be about an hour long. If there would have been more time, 1:30 or 2h would have been better. Felt pens, many black, some red, green, blue. 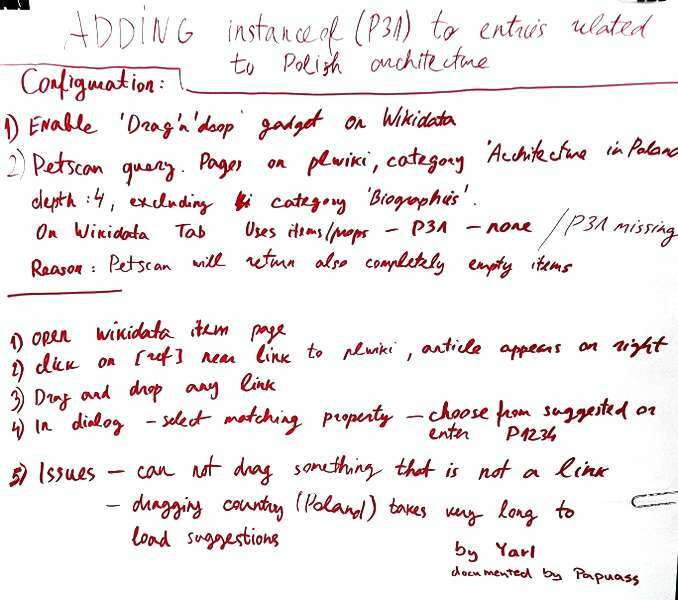 I show examples of possible ways to document workflows. They are mostly lists, sometimes with bits of annotations, rarely an arrow or so. The examples help the participants to get an impression what they will create. I also set a level of detail for the instructions. In my case that might be “The level of detail should be that you believe that a person with basic knowledge of Wikidata is able to replicate your workflow”. This can be important, since there can be people who leave out large parts assuming implicit expert knowledge on the side of the reader (“it is just one step! I work from a list [how is this list made?] and edit [how is the connection from the list? How is the editing done? What is changed?] 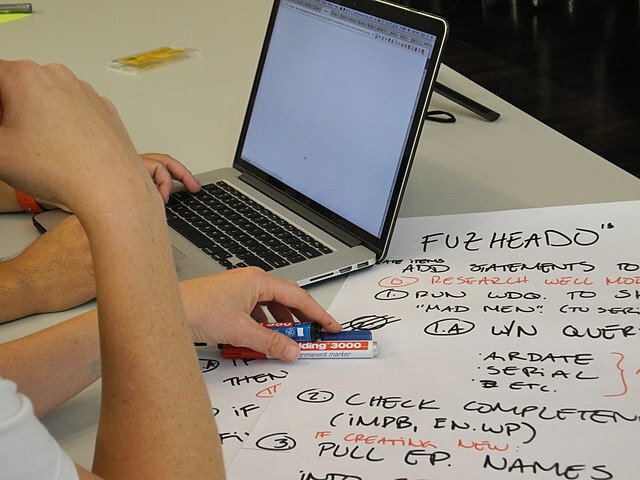 the items!”) or participants can be very detailed, assuming a total outsider (“first, start your computer…”). No position on the spectrum is bad, just make sure the participants are roughly at the same. Now to some organization: Splitting participants in pairs. “Everyone with one’s neighbour” is fast, so is just assigning in the style of “you two, and you two…”. The other participant is the documenter who writes down the workflow and asks questions to clarify. While questions are asked, the written documentation and future result is a core part of the communication process and not an afterthought. I hope this raises its comprehensiveness. Now, everything should be set-up and the participants can start with documenting! While people work, I keep track of the time, take care that they have needed supplies, answer questions or document the workshop in photos and text if everything else runs smoothly. Tell at least 5min before the slot ends; when the time is up remind to do the same again, but with changed roles. Ideally, there is enough time for a “general peer review”: One person from the pair can visit the other participants documentations, the other person stays to answer questions and add clarifications to the document. This would take about 10min. This serves the same purposes as having the documenter/demonstrator split, but now the understanding-part of the documenter’s work is done by other participants, too, hopefully making the process more robust. Whether doing a general peer review or not: Give people 5 min time to check both workflows for ease of understanding and to add clarifications. If they want to be credited, I asked to write their role (documentation or demonstration) and their name on the paper. This took another 5 min. After this, I asked for questions, but there were none. make the writing the names of who-documented and who-demonstrated easier, including an obvious way to opt-out and stay anonymous. If you try this or an inspired-by-format, please share your experiences! Co-Documentation Workshop for User Workflows (Wikidatacon 2017) by Jan Dittrich is licensed under a Creative Commons Attribution 4.0 International License.